Another month of Silver Age Marvel means another look at Stan's "Special Announcements" pages, as he crowed to the readers about all the other superhero delights Marvel would be putting out that month. As mentioned last time, Stan didn't just write up the blurbs once and then copy them into each new mag, but would instead write them from scratch, every time, for every book! Nutty, man. 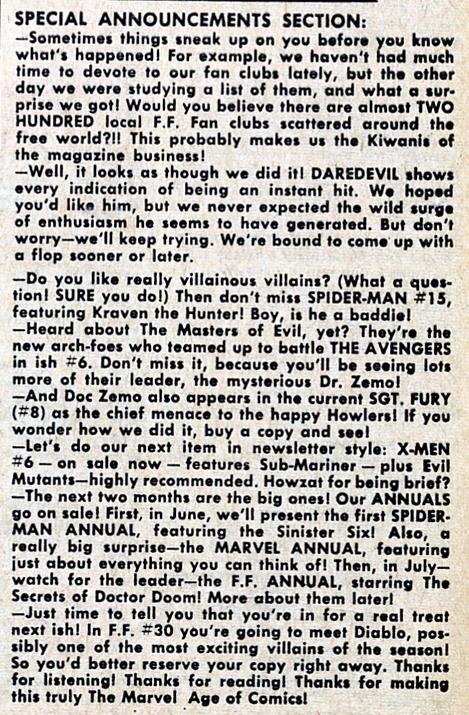 So, as a point of comparison, here are two separate examples of the "Special Announcements" from May 1964; the one above is from Amazing Spider-Man #15, while the one below is taken from The Fantastic Four #29. Compare and contrast! As before, these scans come courtesy of Barry Pearl, author of The Essential Marvel Age Reference Project. Thanks, Barry!